When a respondent sees my postings as plain sloganeering or infer that I advocate totalitarian or fascist dictatorships, it indicates and confirms to my mind how deeply entrenched the mis-education and lack of exposure in the social sciences our educated compatriots are, especially among some who had apparently attended and/or graduated from exclusive, upper middle class private and/or Catholic schools, which produce many "true believers" -to borrow Eric Hoffer's term- who are conditioned to react with outright fear and loathing any social analysis different from their religious or American-dominated worldviews. As one matures in age and experience (or years from school), the wide gaps between theory and practice, school textbooks and reality are hopefully better understood. Life and living is a reality check. Thus, with reference to social issues, an economic or political system which seems clear-cut in the school textbooks are, in the real world, not so; thus one has to be openly eclectic (as in most issues in life or work). To those who seriously want to fully explore the socioeconomic and political topics and/or terminologies ("slogans" to a few), one can easily access and gain deeper understanding of them if one would seek their meaning - by searching the tertiary sources such as the encyclopedias, or better yet, by going directly to the inexhaustible firsthand or secondary sources or publications, e.g. by newspapers, government or institutional press releases, e.g. IMF/WB/WTO documents, or non-governmental organizations (NGOs), etc. whose websites are conveniently found through popular internet search engines such as Google, Yahoo, Lycos, etc. [ It is sad to note that only 1 million or so, among 86 million, Filipinos in the Philippines can afford and have access to the internet, and no one knows how many look for issues of national concern]. Thus, anyone wanting to understand some terminologies or phrases such as poverty reduction, economic well-being, economic democracy/independence, self-sufficiency, common good, social inequality, national interest, et al can easily be found. I wish and encourage all those interested to find time to read far and beyond since that would be enriching, though often not monetarily . By mentioning this approach, I do not intend to appear as being pedagogical. It is only when a large middle class [not just 8-10% of populace as estimated now] has been formed will a western-type political democracy with its institutions be fully appreciated, understood and made to truly serve the interests of the citizens [of a democratic society]. More specifically, in a country like our homeland, when all is said and done, political democracy is not very empowering for the average citizen. The individual Filipino citizen does not feel that he is a participant in nor influence running the country. In his past and present history, unpopular or dissenting individuals/groups, including journalists have been harassed or murdered without redress and justice. Then and especially now, the regular elections and the courts have, more often than not, become a circus and a sham. In times of peace, the citizen feels that he is empowered only by his political connections since the normal democratic institutions do not function effectively and efficiently for him; in times of crisis, he feels empowered only in a crowd, by his participation in a mass demonstration, an EDSA, or the "politics of the streets". Therefore such conception of western-type political democracy is a disappointment, to put it mildly. Political parties have come to be recognized as a necessary part of a functioning political democracy. In our homeland's case, political parties have mainly paid lip service to democratic principles and/or mouthed nationalist pretensions; while the socioeconomic-political elites with the cooptation by the military and/or apathy of many in the middle class, who control these political parties, exploit, fool and look with scorn upon the poor and illiterate, i.e. ignorant mass whose interest they claim to represent. The political parties can only be effective as a vehicle of democratic education and practice, of fundamental changes designed to serve the basic needs of the majority, when their control is taken, peacefully (preferably) or violently, by a politicized, nationalistic citizenry from the relatively small elite group that then and now rules and controls. 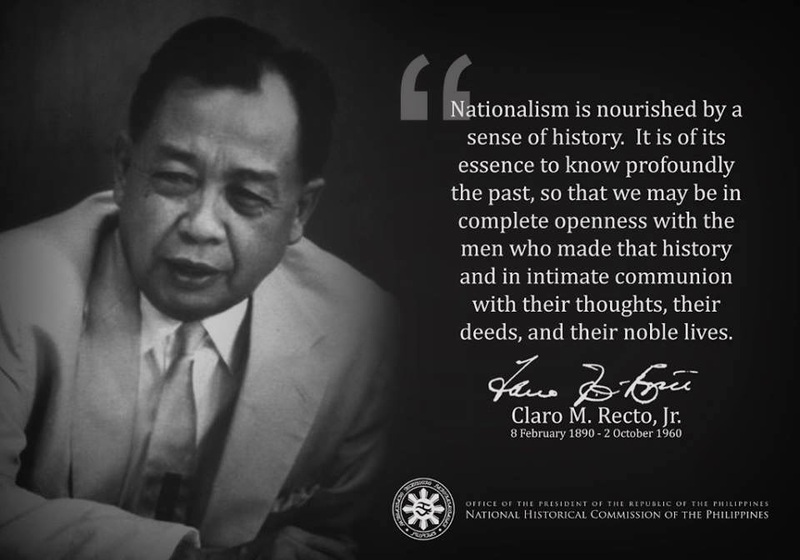 Given the present conditions in the Philippines where peaceful change/reform is practically impossible and armed rebellion is still unpopular, untimely and suicidal, one of the main and immediate tasks of Filipinos in the Philippines today is to learn their history, by firstly politicizing the ignorant multitude to increase their national consciousness and nationalism: to know why the need and how to take control, to correctly identify potential, truly nationalist leaders who will work, fight with them for the economic [firstly] and political [secondly] well-being of present and future generations, preferably peacefully; but, armed with knowledge and understanding, not hesitating to do so forcefully, if required, that is, when every peaceful means have been exhausted. A politicized and nationalistic citizenry will also be capable of monitoring and keeping a watchful and active eye on its leaders to ensure that the leaders truly represent and serve their common good while minimizing violence [we do not want a Pol Pot-like communist revolution]. The 1949 Chinese and 1954 Vietnamese Revolutions were both nationalistic and communist. In both cases, it now appears that they are giving way to accepting capitalism (theoretically opposite to communism and therefore anathema) to economic progress. But these nations' road to economic progress are strongly monitored and controlled, and gradually implemented by a nationalistic though communist cadre/party. I predict that they will evolve into a democratic and nationalistic society in the following decades. In our homeland, ideally, a nationalistic revolution is preferable, if there is such a realizable wish. This feared probability will be hastened when opportunities for our OFWs greatly diminish as it will, given the increased competition from other poor countries because, for now, OFWs serve well as a pressure-relief valve for the social volcano of the Philippines. Unfortunately, I do not find truly and lasting good news in the next decade or two but, I hope I will be wrong.